Scrapbooking doesn’t need be complicated. You should have more time to enjoy making those memories than the time it takes to record them. Digital scrapbooking templates makes it easy! Using digital scrapbooking templates is a simple and easy starting point to record moments that matter from our lives, in what ever way we choose. 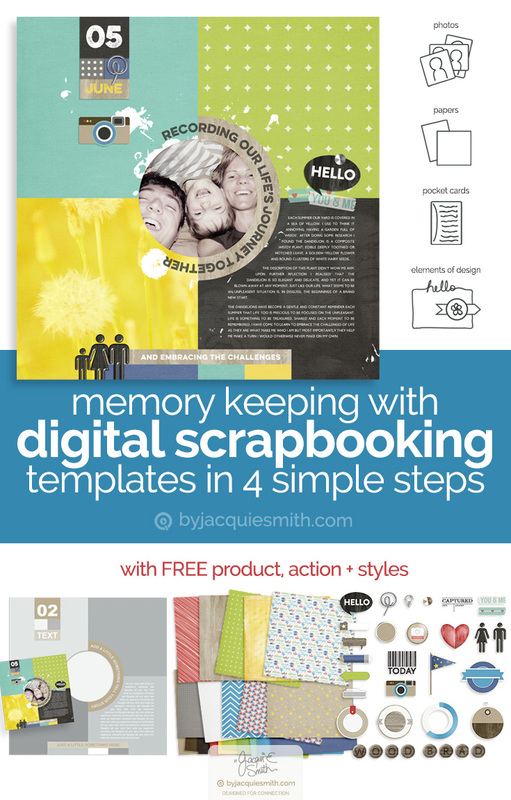 How to use digital scrapbooking templates … in 4 simple steps! The easiest and quickest place to begin recording your memories is with templates. And creating a digital scrapbooking page is no different. You simply drag, drop + clip. It’s that easy. But here I am spilling all the beans. Let’s take a look at how you can have the time to both create + record memories. Digital scrapbooking templates while simple in design are some of the most versatile templates you can have in your supplies. They are the perfect place to begin creating photo albums, vision boards and the ever popular pocket scrapbooking projects. They are the secret to quick + easy pages. There are two kinds of digital templates, pocket style and traditional. The word traditional would be closely related to paper in the scrapbooking world. When it comes to distinguishing the various kinds of digital scrapbooking templates, I use the word traditional to mean templates that are not pocket style. 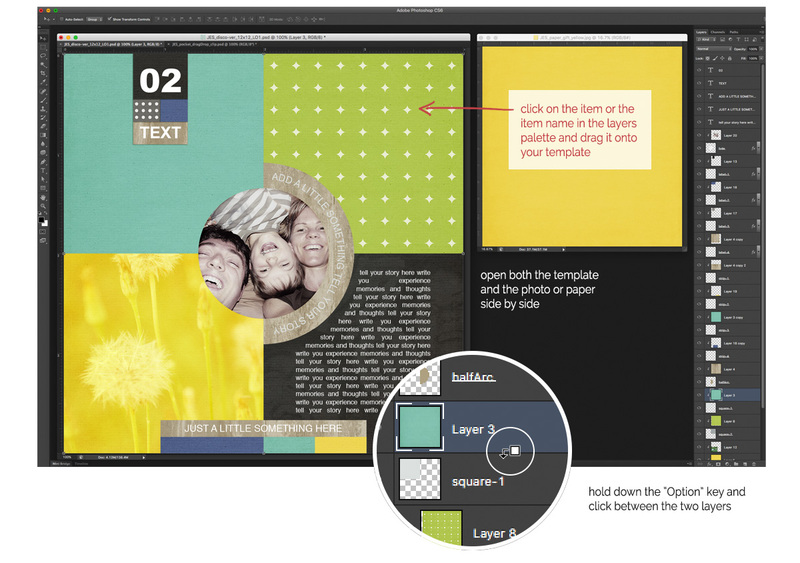 Now let’s take a look at how easy it is to create scrapbooking pages with traditional digital scrapbooking templates. Like pocket pageGrids, they are a fantastic starting point. You can find out more about creating with pocket pageGrids here. These layers are the secret to quick + simple page creation. The main skill in using layered templates is to know how to clip papers and photos to the layers. Select the layer you want to work on in the Layers panel, choose Windows > Layers. Open the paper or photo you want to use. Move it beside your open template so you can see both files open at the same time. Click on the item or the item name in the layers panel and drag it onto your template. (this move is called “drag + drop“, you will use it a lot). It should be sitting above the layer you selected above and selected. Move your arrow between the pocket and item layers, while holding the Option key and click when you see the bent arrow symbol. #Tip: If you want your paper to be positioned to fill the whole page, hold down the Shift key when you drag it to your page. With both the paper and template sizes at 12×12 inches it will automatically fill your whole page. To position your item, click + hold down your mouse and move it around within the layer to position it in place. When your items are clipped to the layer, you can move it around and see only what fills the area. Need to resize, no worries we will do that next. Select the layer of the item you want to resize. From the menu, select Edit > Transform > Free Transform (Photoshop) or Image > Transform > Free Transform (Photoshop Elements). Click on one of the corners, while holding down your Shift key, drag the corner box toward the centre to resize the item. #Tip: Holding the shift key keeps it in proportion. Press Enter/Return key or the green tick to apply your change. Repeat these steps to fill all of the layers with papers and/or photos and complete your digital scrapbooking page. #Tip: Remember to save your work often! To complete your digital scrapbooking page add your titles, captions and journalling. Select the Text Tool (T). Click on your page and drag down to the right with you Text Tool to draw a box on your page. A new layer will be added to your Layers panel. This is the space your text will fill. Select the font, size and any other text options desired. Type your text. To start a new line press the Return (Mac) or Enter (PC) key. If more text is added than fits into your box, resize the box by moving the arrow over one of the corner squares until it becomes a double arrow, then click on and drag the square to enlarge the area. When you are finished typing, click the tick in the Options bar or press Command + Return (Mac), Control + Enter (PC) keys. While it’s not always necessary you may like to add some elements of design : embellishments, stamps + brushes or photo overlays. 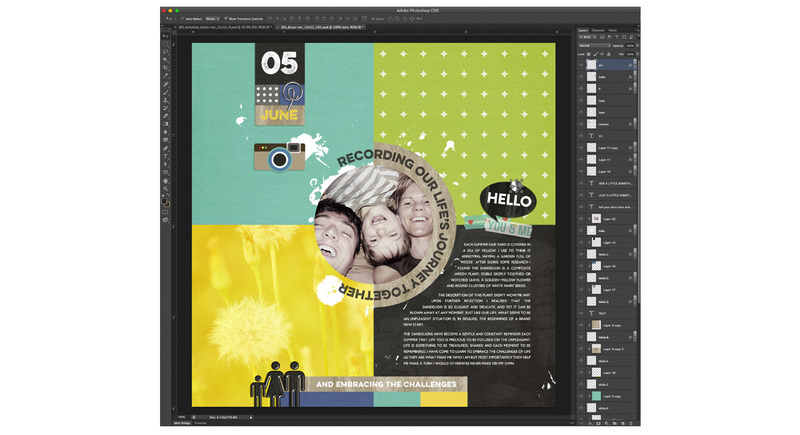 Simply drag and drop embellishments to your page and position as desired. When using stamps and photo overlays be sure to create a new layer first, select Layer > New Layer (Photoshop) or simply click the turned paper icon at the bottom of your Layers panel. Now that you have all your items on your page you may like to add some depth with shadows. I have included three of my favourite shadow styles for your to use with Photoshop + Photoshop Elements. 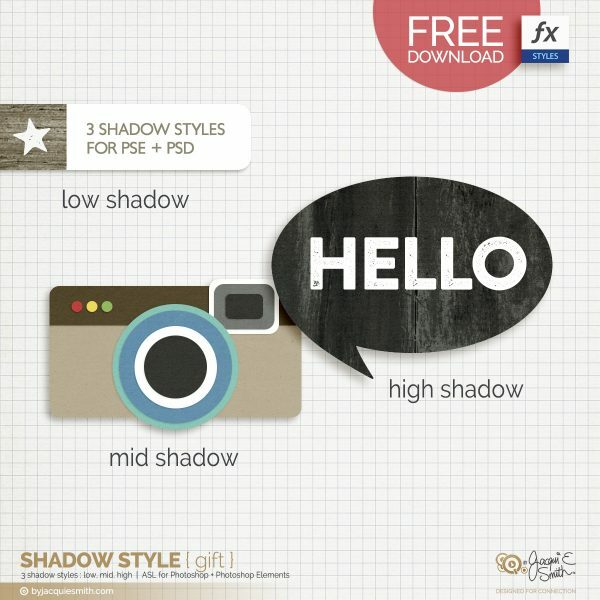 Simply click on the image below to download my free shadow styles. Once you have finished your digital scrapbooking page, hybrid + digital crafters you can print + slide into your album’s pocket page protectors, share your pages online at your favourite forum or facebook group or bind in an album with your favourite photo book company. To print albums with your favourite company you may need to resize your pages to allow for margin and bleed so they don’t cut off the sides of your designs. I have included an action you can use with Photoshop + Photoshop Elements to resize your pages easily. Simply click on the image below to download my free photobook action. Now you are ready to record + share more of your everyday moments!